The holiday traditions of many families, begins with a visit to the local ballet to see the Nutcracker Suite. Of course everyone has their favorite character, and one of ours is the Nutcracker Prince. The Nutcracker Prince begins as a young man (prince) named "Hans", who is transformed into a nutcracker by an army of mice. The only way to break that spell is for the Nutcracker to slay the Mouse King. A battle pursues among the Nutcracker and the Mouse King, but quickly comes to a halt when Clara hits the Mouse King square in the head with her slipper. Ending the conflict, the transformation is made back from Nutcracker to Prince. 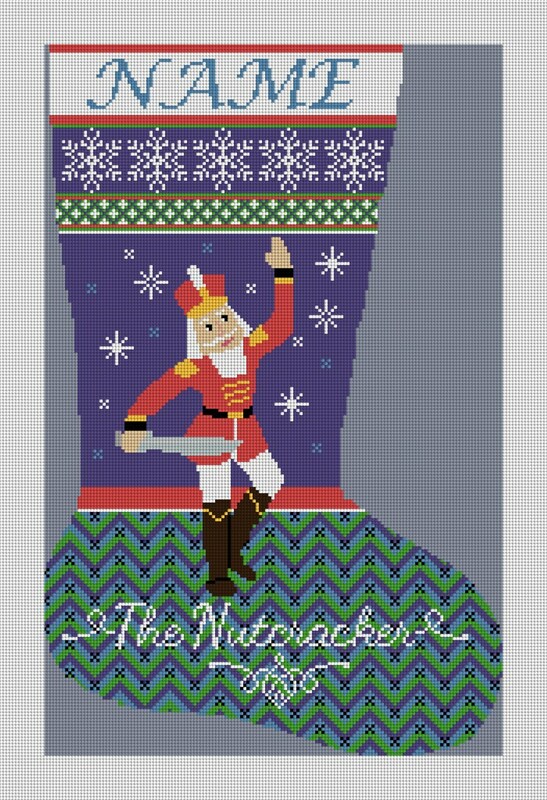 This strong and complex character, has been portrayed on our Nutcracker Prince needlepoint stocking canvas. A wonderful piece to stitch and be displayed on your fireplace, as a stand alone or with one or more of our other Nutcracker Suite Stockings.